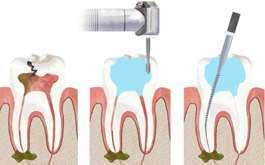 A root canal is a treatment done when a tooth is extremely damaged or infected. 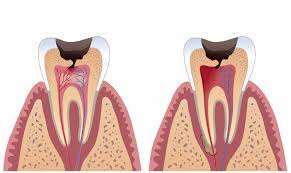 This procedure involves the removal of the damaged area of the tooth also referred to as the pulp, then that area being cleaned and disinfected and then filling and sealing it. the most common causes of a root canal are a cracked tooth, a deep cavity, and dental trauma. 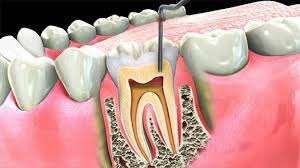 This treatment is called a root canal because it involves cleaning the canals inside the root of a tooth. There are a few steps taken to determine if you have a root canal. If you think that you may need one make an appointment. The first thing your dentist will do is examine your teeth with tools to determine any damage. If your dentist then expects that you may need a root canal they will then take an x-ray. The x-ray will examine the exact location of the tooth decay. There are three steps taken during the procedure. The first thing that your dentist will do is give you anesthesia. This is applied to the affected tooth. Next, an opening will be made and all of the dead tooth pulp will be removed. This process is called Pulpectomy. Lastly, the tooth will be filled and sealed with cement. After having a root canal treatment, you will have to get your tooth restored by a dentist. Getting your tooth restored as soon as possible will help protect it. Once the tooth has been treated and restored, you can brush and floss normally. You should also visit your dentist for regular checkups and cleanings.